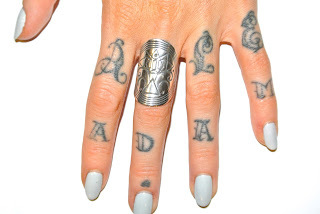 I recently received the most beautiful mandala ring from The Fifth Element Life and had to share because i know a lot of you loved my jewelry lookbook. The Fifth Element Life brand itself was created by the beautiful Sarah Wilder (you can read all about her here) and sells books, jewelry, beautiful prints and more. Her Mandala rings were what caught my eye and i loved that each had its own meaning, offering themselves up as your own beautiful talisman that can be worn always. Although they can definitely make a statement and are larger pieces, they still seem dainty and flow with your anatomy. The one i chose was Intuition, initially because of the design but when i thought about it further, intuition is something i've always tried to hone in on as its never guided me wrong. I love that! "This mandala represents the ability to trust, listen and stay open. To embrace the messages sent to you from the universe." You can find everything you need to know about this beautiful store right here.